The largely improvised 2010 BBC series The Trip, directed by Michael Winterbottom, features six half-hour episodes in which British comic actors Steve Coogan and Rob Brydon go on a road trip and restaurant tour through northern England for the Observer. The two men play fictionalized versions of themselves: longtime friends and occasional rivals who flirt with the same women, argue over trivialities, and frequently engage in dueling impressions of famous movie stars such as Michael Caine and Al Pacino. Coogan’s character is an insecure, egotistical actor trying to manage both his tenuous film career and floundering love life. 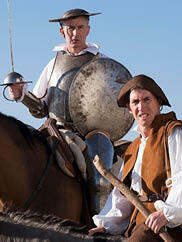 The laid-back Brydon is a happily married family man with a more modest TV celebrity, and Coogan’s perfect foil. Their verbal jousting, supplemented by striking scenery and shots of delectable food and drink, delighted viewers. So, a few years later, the BBC sent Coogan, Brydon, and Winterbottom on culinary tours in two other countries. The Trip to Italy and The Trip to Spain debuted in 2014 and 2017, respectively. Winterbottom condensed each three-hour TV series into an acclaimed feature film, and we show all three in July and August. Now even stay-at-home Ohioans can escape to Europe this summer, if only for a few hours. All three films shown in Morley Lecture Hall and admission to each is $10, CMA members $7. British actor and comedian Steve Coogan is hired by the Observer to travel around northern England to review some of the country’s best restaurants. When his gourmet girlfriend bows out, Coogan asks fellow comic, old friend, and sometimes-rival Rob Brydon to accompany him. The results are deliciously funny. Four years after their first gastronomic odyssey, comics Steve Coogan and Rob Brydon reunite for a grand foodie tour of Italy, exchanging barbs and impressions when not feeding their faces. Aging frenemies Steve Coogan and Rob Brydon embark on a culinary tour of the Iberian Peninsula, riffing on show business, love, marriage, family, and mortality between bites of delectable dishes.